Add sparkle to craft projects with these soft, furry, wire-free Pom Poms. Assorted colors. 1/2". Pack of 80.
can you imagine a glitter caterpiller well i can and i did see them alot this summer! what a beautiful sight. my little ones had so much fun with these. 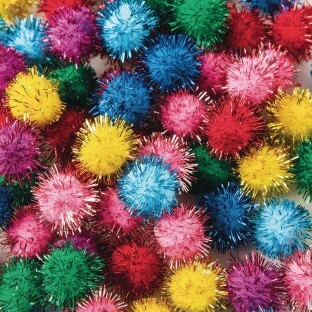 This is a great assortment of pom poms that the children in my classroom enjoy.